Food Intolerance Free Simplified RECIPES ! 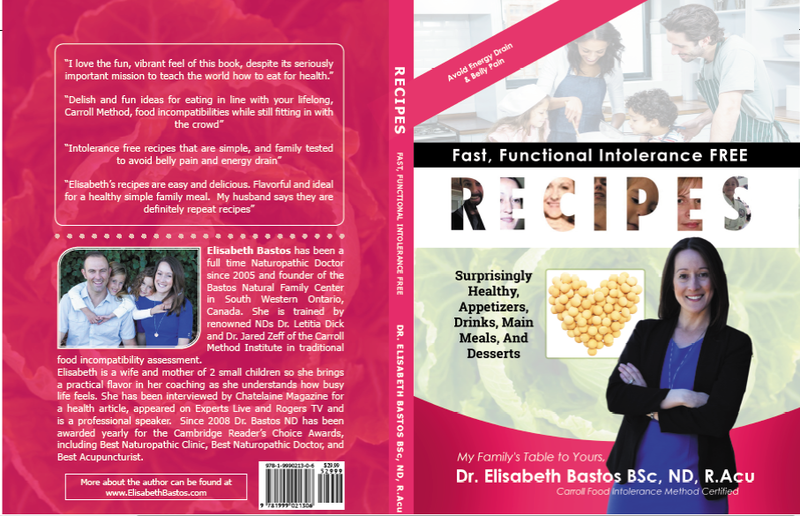 includes your invitation to the exclusive and private food intolerance free mastermind group that is coached with Elisabeth personally. WE SOLD OUT of our local copies in less then 2 weeks! Thank you for supporting our work. With more in print you can still order Now. There are currently over 8 local and international companies selling our book but we appreciate your purchase from this website to allow more proceeds to go towards building a stronger resource based for our sick and frustrated clients. Loaded with useful, functional ideas on how to snack and feed your family from young to old meals while having fun and keeping intolerance free. Recipes are free from the top ingredients based on the Carroll Method Assessment….data collected from over 8 decades of Naturopathic Doctor use. Allowing readers to quickly and easily create a functional menu suited for beginners in the kitchen of all ages. We value having the most amazing customer support around! and support you LIFELONG at NO EXTRA CHARGE on food and eating changes through this membership resource. Instructions on joining are contained in the book. It’s Like Having Dr.Bastos in Your Kitchen Daily to Inspire and Movtivate You! Buy Your Hard Back Copy Now! Buy Your PDF Ebook Copy Now! Great book if you have little ones and are avoiding intolerant foods! I used this book to arm myself with simple treats for parties and dessert at home. I use the gluten free bread recipe daily and it’s a hit for everyone..amazed how well it turns out but is potato and corn free ! Still Sitting on the Fence and Not Sure if You Are Ready to Divulge in Intolerance Free Fun ? Download a mini version of the book, Free on us, to sample the style and a few recipes on for size.